Hawaii is my home. I love so much about Hawaii, including the Asian influence that is a part of Hawaii's culture. For years I looked for a way to merge some of my interests: recycling, textiles that feel good to touch and are beautiful to see, and functional art. Creating these unique jackets and vests is my way of bringing my different interests together. 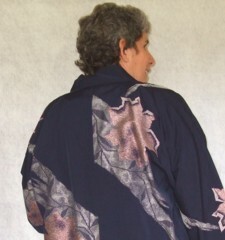 It is a pleasure to work with the fine silks that kimono and obi are made from, and to meld them into new creations that can be worn to enhance daily life.